(1) ICN Editorial - The Mystery of Pelvic Pain - ICN President Jill Osborne offers new insight into understanding, diagnosing and treating pelvic pain, particularly if you're not responding to therapy as well as you'd like. 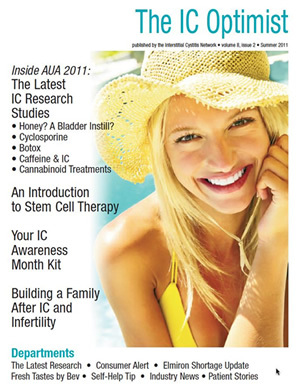 (2) Inside AUA 2011- The Latest IC Research - The American Urology Association annual was chock full of new promising research studies including several new potential therapies. Read the latest research into the use of honey as potential treatment, cyclosporine, Botox, cannabinoids, gene therapy and a new, interesting treatment emerging from Europe. 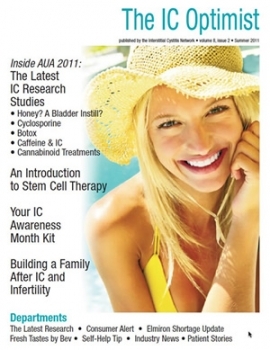 (3) IC and Stem Cell Therapy - Stem Cell Therapy is the new, hot topic in IC support groups around the world. We've interviewed Dr. Eliot Lander of the California Stem Cell Research Center who discusses their current research AND addresses common questions and concerns. The stem cells used are derived from an individuals fat cells that are taken during a brief liposuction procedure. Fetal stem cells are NOT used. (4) More IC Research - Abstracts Which Caught Our Eye - Three new studies from late Spring and early summer which we found particularly interesting. In the first, researchers in Chicago discovered that certain strains of e-coli appear to trigger chronic pain that persists even after the infection has been treated. Dr. Lowell Parsons latest study on the Tamm-Horsfall protin reveals that the construction of the bladder wall may be part of the problem. 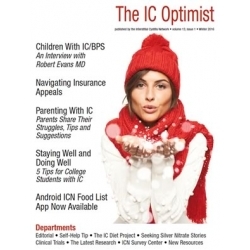 Lastly, patients with IC and Sjogren's should find comfort in a case study which showed that cyclosporine dramatically improved symptoms in both conditions. (5) Sugar Boosters May Help Fight Bacterial Infections - Why are some bladder infections so resistant to treatment? Researchers in Boston share new findings about "bacterial persisters," and how the use of sugar to improve an antibiotics effectiveness appears to help destroy these stubborn infections. (7) Industry News - Were you stunned when you couldn't refill your prescriptions for Elmiron in the past few months? We cover the elmiron shortage and address concerns. Elmiron has not been discontinued. It was a simple manufacturers shortage. We also share info on an upcoming generic pentosan polysulfate with the brand name Comfora, now in use in India and selected countries. 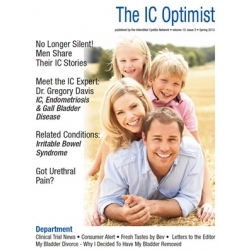 (8) IC Awareness Month Kit - Every magazine includes a poster, proclamation request, press release and thank you letter that you can use to help raise awareness for IC during our September PR campaign. PLEASE NOTE THAT YOUR DOWNLOADABLE FILE LINK WILL BE INCLUDED IN YOUR ORDER COMPLETION EMAIL!.